A scorecard may be accessed from the 'Rounds' tab by long-clicking a date on the list, or from within an Edit Round screen. The scorecard for the round with the most recent date may also be accessed from the Clubhouse tab by clicking the 'Latest Scorecard' button. The majority of columns on the scorecard are 'toggle-able'. To show or hide a particular column, click the Menu key on your phone and select the 'Scorecard Layout' option. The screen shot below shows the scorecard with all of the optional columns hidden (achieved by hiding columns individually or by selecting the 'Hide All' menu option). 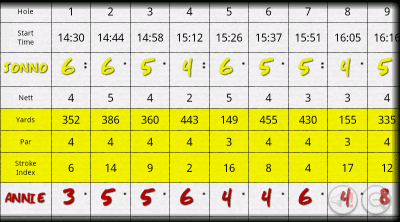 To enter the number of strokes a player has taken, click the appropriate cell on the scorecard as shown. The nett scores etc. and the scorecard totals will be updated immediately as values are entered, according to the scoring system selected for the round (which may be changed mid-game if required). 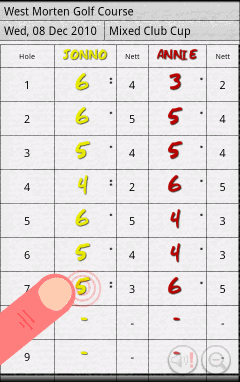 Small dots displayed next to the selected value indicate that the player has received extra strokes on the hole. To view the later holes, scroll the scorecard with your finger. 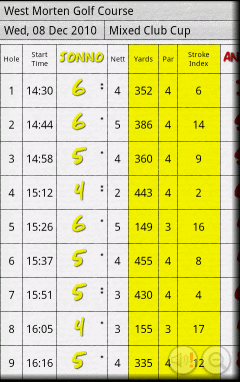 This minimal view will typically mean that no sideways scrolling is required to access all scorecard cells. 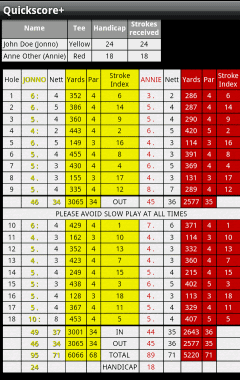 The following screen shot shows the scorecard with all columns shown (excluding the pin proximity column). This may be achieved quickly by using the 'Show All' menu option. Scroll the scorecard sideways to view any columns off screen. The scorecard may be toggled between showing the details for each hole horizontally or vertically by selecting the 'Scorecard Layout' menu option and either ticking or unticking the 'Horizontal Orientation' checkbox as appropriate. If teams have been configured then the scorecard will show a score column for each team rather than for each individual player. The team score for each hole will be calculated according to the lowest nett score of all players in the team (i.e. Best Ball format). To prevent the scorecard from switching orientation between landscape and portrait as you move the phone, it is possible to 'pin' the scorecard in the desired orientation. Tap the pin icon to toggle between fixed and unfixed orientation. If the pin is not displayed then it may be activated from within the 'Scorecard Layout' menu option. The magnifying glass button in the bottom right hand corner will, when clicked, display a zoomable version of the scorecard. This will typically allow the scorecard to be displayed in it's entirety on a single screen. The version of the scorecard shown is the version that will be emailed when the 'Email Scorecard' menu option is selected from the main scorecard screen. A Preference option is available that, when set, will cause the zoomable scorecard to always show all columns (excluding hole timings and proximity) regardless of the columns currently being shown on the main scorecard. If a warning triangle is displayed in the header of the scoring column then this indicates that the Stroke Indexes (or handicaps) for the tee have not be correctly configured. As a result, the scores shown may not be accurate. The performance charts that show how you have previously performed on a particular hole or tee are also accessed from the scorecard. For details on this see here. The scorecard also has various range finding features. Firstly, it is capable of displaying your current proximity to the pins as you play. For details on how this is configured see here. It is also possible to measure the distance of your shots. See here for details. Plus, it is possible to view your current position on the course and measure the distance to any other point on the course in order to plan lay up shots etc. For details click here.